In The End of Representative Politics, Simon Tormey challenges the assumption that politics and democracy are ‘dead’, blighted by chronic distrust of the political class and undermined by the perceived failure of representative democracy to secure social justice. As Tormey instead points towards emergent forms of ‘subterranean’ politics indicative of a ‘post-representative’ era, Ali Dadgar argues that The End of Representative Politics proposes a novel and informative expansion of the scope of ‘democracy’ and ‘politics’ in the contemporary moment. The End of Representative Politics. Simon Tormey. Polity Press. 2015. The End of Representative Politics sits within the recent body of debates that strive to answer the question of whether we should accept democracy as a ‘moribund’ reality in an era in which people in advanced democracies trust their elected politicians even less than ‘second-hand car salesmen’. This concern is amplified in the context of the current global financial crisis: a situation in which ordinary citizens have become more than ever convinced that the political class is not truly representative of their interests, and that representative democracy is not necessarily a trustworthy vehicle to safeguard social justice. Simon Tormey, Professor of Politics at the University of Sydney, has already shown his expertise in critical theory and in anti-capitalist and global justice projects in his previous books, notably Key Thinkers from Critical Theory to Post-Marxism (2006, co-authored with Jules Townshend) and Anti-Capitalism: A Beginner’s Guide (2013, revised). In The End of Representative Politics, however, Tormey has adopted a different stance from those who believe that politics and democracy seem to be ‘dead’. The book tries to recast the crisis with which representative democracy, or ‘party-based democracy’, has recently been grappling. The first chapter is dedicated to reviewing the ‘contours’ and ‘symptoms’ of this crisis as outlined in the literature: over recent decades, data show an overall decline in the voter turnout, which means that people vote less; they are less likely to join a political party; they show the least interest in the affairs of state and of the political class; and they trust politicians less than ever. But what implications do these lines of crisis have for politics and the future of democracy? Tormey insists that apathy toward ‘mainstream’ electoral politics does not mean that ‘people are uninterested in politics’ at all. He provides a detailed account of three examples of what he names ‘subterranean’ or ‘non-representative’ politics – the Zapatistas, the World Social Forum and Occupy Wall Street – in order to develop the idea that there are other ways of doing politics outside and beyond ‘official’ politics. From his viewpoint, those who are engaged in ‘unofficial’ politics don’t like being represented and spoken for. Instead, they want to be their own delegate and their own voice. The proliferation of such modes of doing politics, as is reasoned throughout the book, contests the predominant claim that politics and democracy are in decline, and that we are now living in a ‘post-political’ or ‘post-democratic’ time. Quite to the contrary, Tormey argues, we are living in an ‘intensely politicized’ time. What is in low ebb is just one form of politics, representative politics or the politics of politicians, which offers only a ‘thin basis’ for, rather than the whole idea of, democracy. The emergence of ‘non- or anti-representation’ politics signals that something is ‘altering’ in the political field; something with which ‘representation politics is failing to engage’. In a broader sense, it prompts the questions: why are we entering into a ‘post-representative’ time and what are the characteristics of such an era? On its way to answering these questions, the book presents a detailed description of the origins and evolution of the concept of representation in capitalist countries. It examines how representative politics in its advanced forms, thanks to the functional division of labour, brought about a ‘disjuncture’ between elites and ordinary people, a disjuncture that led to citizens’ ‘alienation’ from ‘traditional representative bodies’ such as political parties and trade unions. Although this description outlines the moment of ‘break’ with the party-based form of politics, Tormey continues, it is still hard to explain why we ‘resist’ representation and representative politics until the underlying mechanisms of change are uncovered. Again, what is altering? 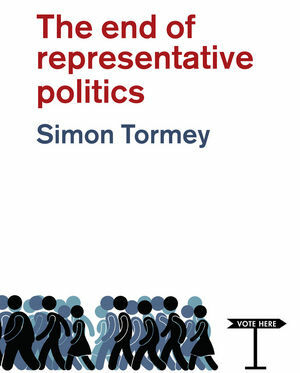 After classifying, reviewing and criticising existing explanations of the crisis of representation, Tormey presents his own account in the third and fourth chapters of the book. According to his sophisticated narrative, contemporary societies underwent substantial transformations in the way that a representative discourse is displaced by new political discourses. Where parties in traditional representative politics were vehicles for representing different segments of society on the basis of their common identities, common ideologies and common interests, now we are living in a situation of a ‘much more complex mix of identities’, a ‘disparate assemblage of cultures’, which are too heterogeneous to fit the old moulds. In the era of declining collective identity and grand ideologies and expanding ‘reflexive individualization’, the people are increasingly becoming an ‘unrepresentable jumble of individuals and identities’. Thus, the aura of representation is gone and we are becoming unrepresentable. Through this individualisation of politics, a nascent discourse seeks to create new initiatives and organisations which involve people ‘immediately’ and ‘directly’: what the author has termed ‘disaffiliated activism’ that is beyond and outside of political parties. Examples include street protests, demonstrations, carnivals, sit-ins, occupation movements, production boycotts, hacktivism and cyber protests. These new forms of activism tend to have ‘horizontal’ hierarchies and are more flexible, participatory, collaborative, spontaneous, non-representative and far less ideological. Instead, they are mostly created around a shared sense of inequality. At the end of Chapter Four, the author extensively discusses how social media has played a tremendous role in the transition to a ‘post-party’ form of democracy. In the fifth chapter, Tormey uses his model to illustrate one case of the ‘mobilization of the unrepresentable’ in Spain since 2011, the 15M movement, to show how ‘micro-parties’ are taking the place of mass parties. The last chapter of the book, entitled ‘Democracy After Representation’, addresses the forms that ‘post-representative’ politics might take. Tormey’s argument that we are still ‘democratic’ reminds one of Ulrich Beck’s assertion that we are still ‘modern’, and that what has happened is a transformation of ‘basic institutions of modernity’ rather than ‘a clear break with the basic principles of modernity’. Seen in this way, what is taking place is a paradigm shift from representative to non-representative politics: neither de-politicisation nor the end of democracy. Overall, the book is a clearly written and informative text that offers novel insights and is successful in developing a new approach to our understanding of the present and future of politics and democracy. Ali Dadgar holds a BA and an MA in sociology (Shahid Beheshti University), and an MLitt in politics (University College Dublin). He is currently a PhD student in the Sociology Department at the University of Windsor, Ontario. His recent research interests lie in the fields of social and political justice, critical sociology, Iranian sociology and proportional representation. His doctoral research focuses on the extent to which the composition of political representatives in post-revolutionary Iran in terms of their socio-economic background is matched with that of the general population.